We carry copper downspout coil to fit your 2x3 and 3x4 downspout machines in 16 oz. Copper. Please Note: 10.5 x 16oz. 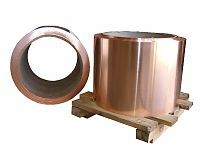 Copper Coil can only be purchased in 1000 lb. increments and may require additional lead times. 16 oz. copper is the standard in the industry and measures .0216" in thickness. 10.5 x 16 oz Coil Copper - ( 16 I.D.) $5.92 / LBS. 13.75 x 16 oz Coil Copper - ( 16 I.D.) $5.92 / LBS.